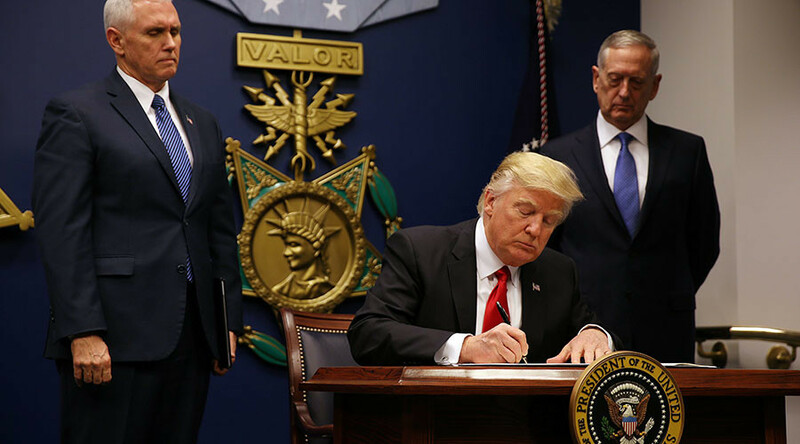 President Donald Trump’s new executive order banning residents of six countries from entering the US has been met with criticism as people question the countries targeted and claim there is little difference from the original ban. The new order exempts Iraq from the travel ban, but Iran, Libya, Syria, Sudan, Somalia and Yemen remain on the list of offending countries. Visas will not be issued to anyone from those countries for 90 days, and refugee admissions have been halted for four months. Muslim ban remains intact. Bigotry against 6 countries is the same as bigotry against 7 countries, or 70 countries or 1 country. Fight this! While the new order removed Iraq from the list of banned countries, journalist Michael Tracey noted that an example within the order points to two Iraqi refugees who were arrested on terrorism-related offences in the US as part of the justification for the order. The order explains that while parts of Iraq are a combat zone, with ISIS strongholds in the north and central regions, the “close cooperative relationship” between the US and the Iraqi government is enough to “justify different treatment” for the country. People questioned the justification for the ban, pointing to the US’s role in creating refugees and terrorists. Others queried why the six countries had been targeted over others, with social media users pointing to business interests as a possible explanation. Under new #MuslimBan ISIS leader al-Baghdadi can apply for a US visa appointment. Syrian child refugee and Iranian PhD student cannot. And now Homeland Sec. John Kelly would like to remind you about 9/11. None of the #MuslimBan countries were home to the 9/11 terrorists. Unlike the administration's first attempt at introducing the ban, Trump signed the order away from the media and has not yet tweeted about it. White House press secretary Sean Spicer was criticized for holding an off-camera press briefing to discuss the executive order, as well as Trump’s claims that President Barack Obama wiretapped him during the election.